The Fed announced they would be pulling back some of their stimulus package which has helped the housing market by keeping long term mortgage rates at historic lows for the last few years. This should come as no surprise as the KCM Blog has been warning of this likelihood over the last several months. 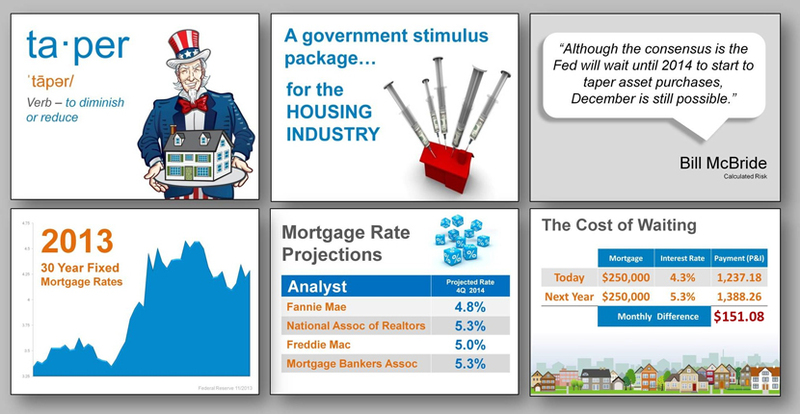 We also gave our members the following grouping of slides to help them explain the ramifications of the Fed’s decision during meetings with buyers and sellers. In an article in MarketWatch today, Lawrence Yun, the Chief Economist at NAR, explained that sellers looking to move-up (to a better school district or larger home) “need to realize that it could be more challenging a year from now.” Yun stated the average 30-year mortgage rate currently hovers at 4.3%, but that could rise to 5% or 5.5% next year. Some reports will now claim that housing prices will have to drop as interest rates begin to rise. There is no historical evidence of this. 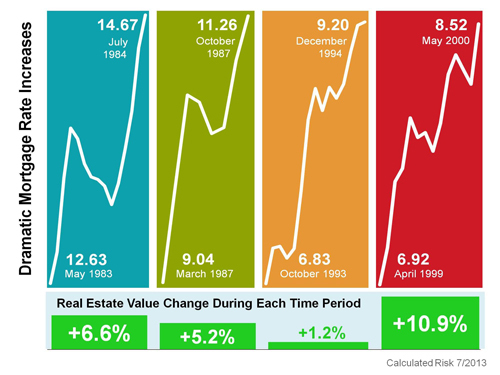 Below is a chart showing the last four instances of mortgage rates rising dramatically and what happened to home values at the time. If a client is either a first time buyer or a move-up buyer, they should make the move earlier in 2014 instead of later as mortgage rates will probably increase as the year goes on.